Last August we launched our Facebook iPhone website, and almost a year later it has over 1.5 million people using it regularly. We are thrilled to see so many enjoying Facebook on their iPhones, so we've been working on ways to take our iPhone experience to the next level. Today, Apple has opened the doors to its App Store which features a new application we've created: Facebook for iPhone. You're probably wondering what makes our iPhone application different from our iPhone website. The bottom line is that applications built for the iPhone have access to more technology than websites. For example, with the native application you can take photos with the iPhone's camera and upload them instantly to your Mobile Uploads album on Facebook. You'll also find the native application is much faster than the website, giving you more reliable access to your Friends, Photos, and Inbox. 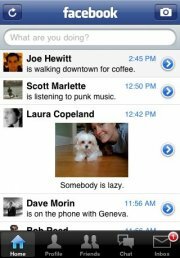 Facebook for iPhone also brings one important new feature to the iPhone - Facebook Chat. Wherever you are, you'll be able to see which of your Facebook friends are online and chat with them for free. The first version of Facebook for iPhone is just a glimpse of the future. For instance, the iPhone has the ability to find where you are located, and we are looking for ways to let you opt-in to share your location and discover nearby friends. We're developing this and several other exciting new features that we'll release in the coming months. Joe, a Facebook engineer, built Facebook for iPhone. أنت، ‎Şevket‎‏، ‎Georgia‎‏، ‎Anwar‎‏ و 12‏ آخرين‏ آخرين معجبين بهذا . ‎Anwar‎, ‎Georgia‎, ‎Şevket‎ and 12‏ آخرين like this.